Hmmm..I don't remember ever seeing one announced. They did release a 1/72nd one. I have found no mention of a 1/32nd one on Google, either. Thanks Ray. I saw it listed in a couple of announcement lists for 2010, as well as our own Kit Database, but like you, I could only find evidence of the 1/72 kit. I think I might just remove it from the database, and if it ever surfaces, we can add it back. Works for me. It's not like we can't add it later if it ever sees the light of day (assuming it wasn't a scale error in the first place). Now, I actually have this kit in the stash (minus decals), and the year isn't given anywhere on the box, instructions, or parts (that I can find). A copyright date on the parts is only good for the initial release, but I'm led to believe that this may in fact be the first release of this kit. So, my question is obvious: does anybody know what year this boxing was released? And was it really the initial release? If so, that should make it easier to work out the date. It's a Hales boxing of the Hasegawa kit, for the UK market. Note sure of the year, but Hales were chucking these out in the very early 70's, I think 1970 or 71. I've the exact same kit & you're right, absolutely no dates given anywhere. Thanks, Dean. The one in the photo has the Hales sticker for the UK market, but mine doesn't. Otherwise, the boxes appear identical. What's the kit number on yours? Mine says JS-089:1000. OK, fellas, it's come to my attention that we have no box cover image of the Academy F-16CG/CJ kit. Can anyone help out by taking a good square head on photo and sending it to us? This thread is almost as old as Harvey's P-38 build thread. 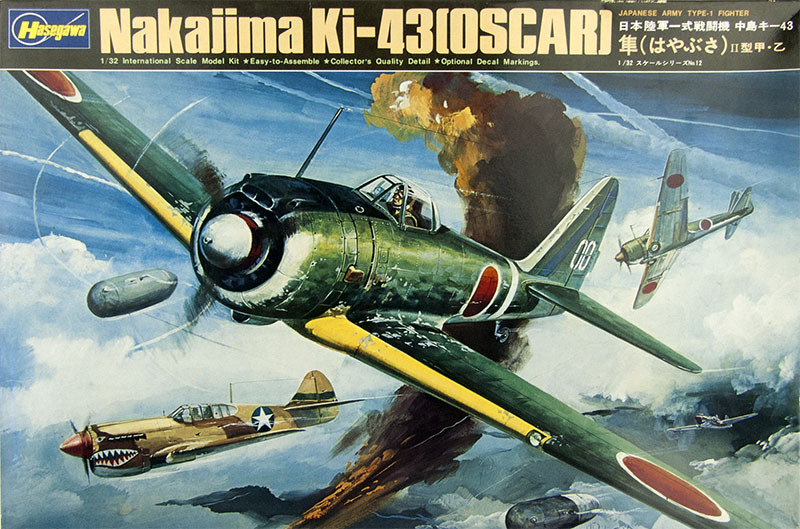 The first Hasegawa 32nd kit I ever saw was the Peashooter, about 1970, followed closely by the Zero 52, then the Bf 109E, I think about '74 then the Oscar in about '75. These were at a Squadron shop when it was located on 9 Mile Rd and John R just outside of Detroit. I also have both Revell and Hasegawa F-104 and they ARE completely different. Saw this P-51 on the net. Couldn't find it in the database.